Presentation Skills Training for Leaders. Master your technique and confidence with these concise skill-packed videos from the world's #1 body language expert and presentation skills trainer for the world's #1 Executive MBA, Fortune 50 CEOs and G8 leaders. This video training is the one-stop-shop to increase your leadership executive presence whenever and wherever you present, and includes information packed quick study reference materials for download. Discover new ways to engage your audience with PowerPoint—not powerpoint-less! 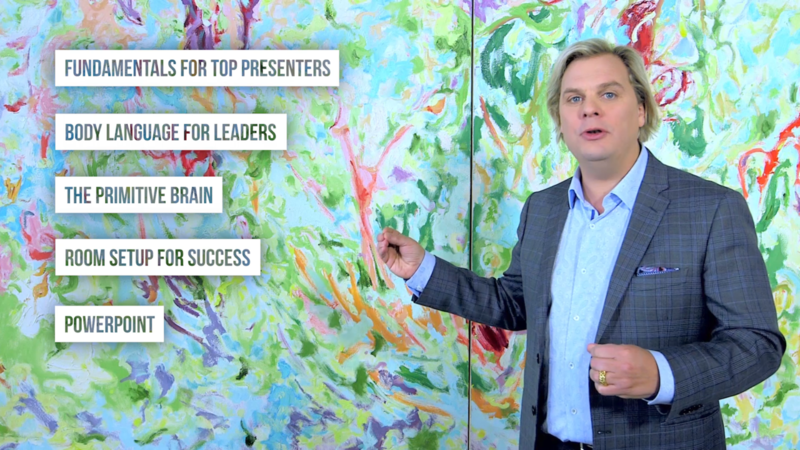 Presentation Skills for Leaders Pricing Special! Purchase this series of six concise and compelling video episodes now, and get just under half-an-hour of the most effective and accessible presentation skills training for leaders available, along with many more bonus videos our downloadable Communication Success Quick Study Guide—packed with top tips from Mark Bowden on the fundamentals of communication and the TRUTHPLANE® GesturePlane™ method, presentation prep checklists, fast steps to impactful and persuasive communication, and much more; and our downloadable at-a-glance GesturePlane™ System Guide. This unique and highly sought after training will help you quickly learn how to stand out, win trust and gain credibility every time you speak! Our special pricing offer is only available to the first 50 buyers, so don't delay, buy now and get a head start on raising your presentations to the next level.